We love our sedans and the practicality of a smaller package in city traffic is easily superseded by the perceived status of having a boot. Audi has taken their time joining the entry level luxury segment in India that was pioneered by the B-Class. Both Mercedes-Benz and BMW have existed in the below 25 lakh segment for some time now but the Volkswagen Group's MQB platform based A3 sedan should certainly appeal to the 'bada gadi' crowd. The excellent starting price of Rs 22.95 lakh (ex-showroom, Delhi) for the entry level diesel means that the A3 sedan can be had for a price lower than its hatchback competition. On the whole the A3 is a very familiar design similar to the A4. In fact it looks a lot like all of its brethren albeit in a smaller package. It still manages to bring a welcome sharpness to the family look that's a breath of fresh air. The sleek headlamps lend the front end an edgy aggressiveness that is a great match to the sharp tail lights that are neatly sliced by the sharp shoulder line that runs around the boot. It's aimed at the young professional and as such we think Audi has got the look spot on. It finds a healthy middle ground between the CLA (when it gets here) and the B-Class and not quite as radical as the A-Class and this alone should find it a lot of takers. Stepping inside you notice that the feeling of freshness continues and while the cabins of its larger siblings can get quite busy with a lot of knobs, dials and buttons the A3's interiors feel just right. 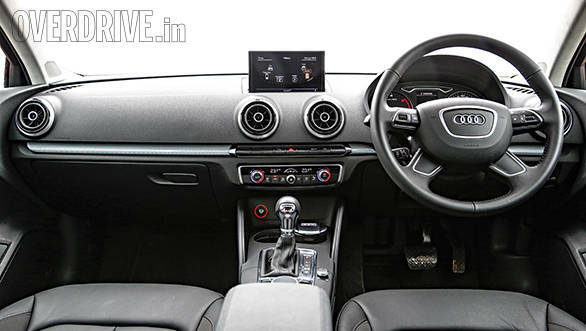 The clean look of the dashboard is dominated by the four new air-con vents that are quite an intricate though busy design. They are functional too, twist to adjust the flow and pull out to diffuse it. This minimalistic design theme continues to the rest of the interiors as well with the new layout of the MMI controls looking less busy than before. 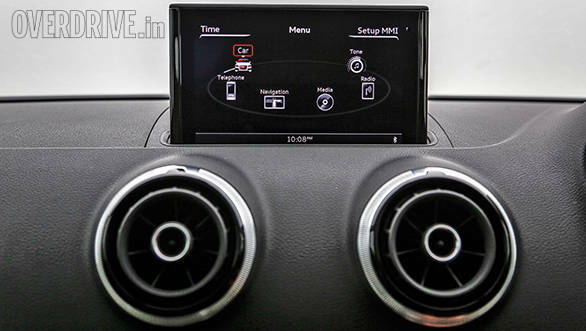 Even the MMI screen electronically disappears out of the way to clean up the dash even further. The fit and finish of the materials used is spot on and owners familiar with the brand won't feel short changed with the quality. 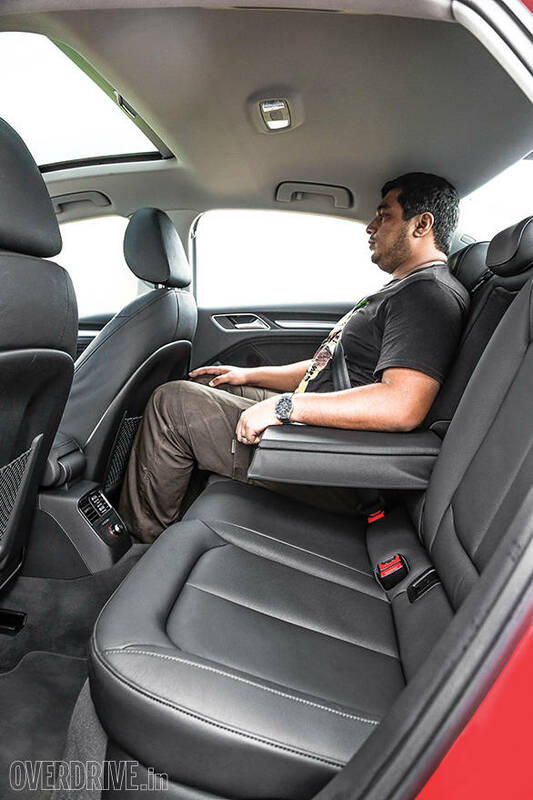 The front driver seats are supportive and comfortable for long stints behind the wheel. The S line that we drove gets electronically adjustable driver and passenger seats but in the entry level diesel Attraction trim the passenger seat will be manually adjustable. When you move to the rear you'll notice that there is a reasonable amount of leg room for a compact sedan. But what is lacking is head room and when seated upright in the rear seats, my head (I'm 5'9") would come in contact with the sloping sides of the roof liner. This is not the place you want to be sticking two adults on a long journey, but a two plus two family should have no problems. It doesn't match the interior space of the B-Class but will compare more with the A-Class and the 1 Series. Where it beats them all though is in the third box. The A3's boot is large enough for a whole holidays worth of luggage and the rear seats also fold down giving you even more space should you need it. Its 425 litre boot easily surpasses that of the A-Class and the 1 Series but is less than that of the B-Class' 486 litres. 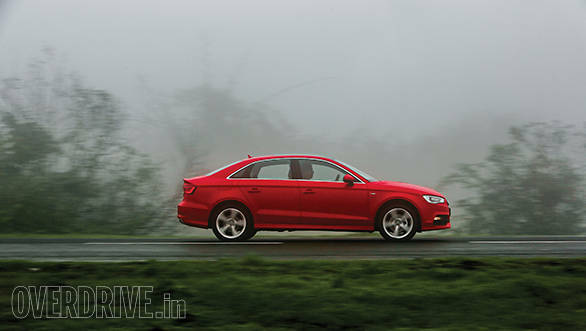 The A3 comes with just two engine options in India. 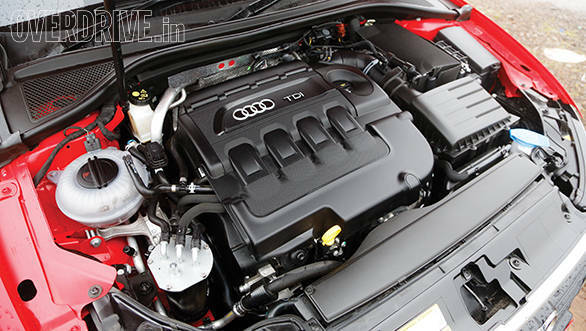 A 1.8-litre petrol dubbed the 40 TFSI and a 2.0-litre diesel bearing a 35 TDI badge as per Audi's new nomenclature system. This is the first time we will be witness to this new system which is based on speed and acceleration of the cars and simply put, the higher the number, the faster the car. For now we have just tested the diesel mill which is mated to the 6-speed S tronic DSG automatic transmission. We're quite familiar with the 2.0-litre diesel that also drives our long term Skoda Octavia. In the A3 this 1968cc engine makes 143PS between 3,500-4,000rpm and puts out a healthy 320Nm between 1,750  3,000rpm. This refined engine is best kept in the meat of the chunky torque where it has plenty of low down poke making for quick overtakes and effortless cruising around town and on the highway. It's not the quietest though, and on the outside you can clearly tell what fuels it sips from the diesel clatter emanating from under the hood. Inside the good soundproofing ensures that the idle engine note stays on the outside where it belongs. The 6-speed dual clutch gearbox is alert when on the move and is smooth when you're crawling back home. The petrol for some reason gets a 7-speed S tronic gearbox. Unfortunately on the day of our performance test the weather was not the best and the tricky conditions meant that we couldn't complete a top speed run and the lack of grip also affected the acceleration runs. The A3 completed the 0-100kmph sprint in 9.66s and eagerly pulled all the way up to 170kmph but unfortunately the heavens really opened up and we had to back off. This compares reasonably well with Audi's claimed sprint times of 8.6kmph for this motor. Audi claims a top speed of 215kmph and from the amount of performance still on tap at 170kmph, we see no reason to doubt that claim. In our fuel efficiency tests the car returned a respectable 22.1kmpl on the highway run while the city efficiency was 13.8kmpl. This gives it an overall figure of 15.83 that compares well with its competition the B-Class (14.1kmpl) and the 1 Series (14.0kmpl). The A3 was quite a pleasant surprise and its suspension tuning has found a great balance between comfortable ride quality and sporty handling. And even on some fairly broken roads we felt quite insulated from the road imperfections. It does get a little bit upset over sharp bumps and big potholes but in its class of peers we feel that the A3 probably has the better balanced package. Up the pace and you immediately feel that this is quite an agile chassis. There may not be too much feel flowing through the steering wheel and that's become an Audi tradition but it is precise and after you get used to the rate of turn your increased confidence and the agility of the chassis allow you to have some fun. For a front wheel driven car you can push quite hard into corners before understeer starts to creep in. The package is also extremely stable, particularly at speed and on our high speed run, despite the tricky conditions there was never a feeling that we were ever on or even near the edge. 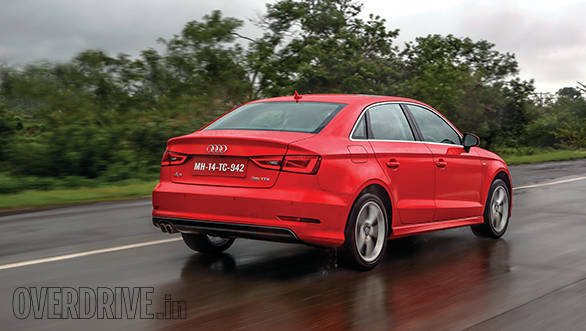 I can't wait to see if Audi will bring the S3 to India. I would love to see what 300PS in this neat little package feels like. The A3 is a sensible product considering that it's entering a market filled so far with three very different hatches that haven't yet sparked the imagination of the nouveau riche. It is a quality product and one that doesn't feel like it was built to a price in fact it's already been voted the 2014 World Car of the Year. It's also a fairly fun package with excellent ride quality and fun handling. At the price that Audi have launched it, it's sure to ruffle a few feathers in the Mercedes-Benz and BMW camps in India. 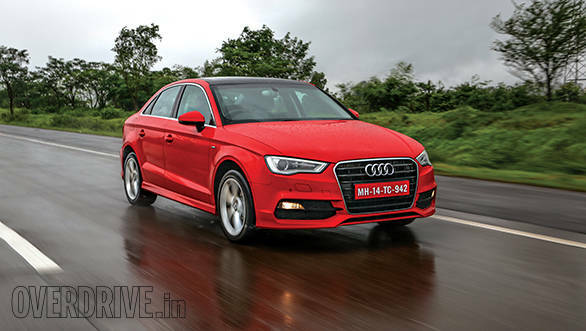 The Audi A3 road test and more in the September 2014 anniversary issue of OVERDRIVE. Grab your copy now.